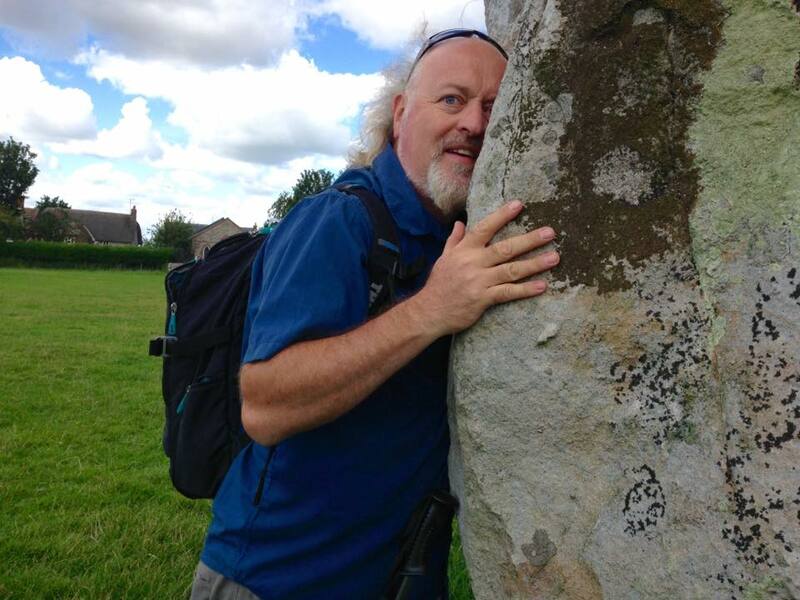 Apparently, Bill Bailey’s current tour involves tales of the comic finding himself in a halfway place, railing against a world that doesn’t match up to expectations, while contemplating the true nature of happiness. He’ll no doubt touch on his countless global travels too, while recounting a disastrous family trip to Norway to see the Northern Lights, and … well, you never quite know what you’re going to get with Bill. The 51-year-old remains a familiar face on our TV screens, whether it’s for Never Mind the Buzzcocks, QI, Black Books, Spaced, Dr Who … you name it. His latest tour has already received rave reviews in Australia, New Zealand, Hong Kong and Singapore, and this past week was in Ireland for the first eight dates of more than 90 – taking him up to mid-January and culminating in a 30-plus date Vaudeville Theatre residency in London’s West End. It’s not all over then either, Limboland carrying on right through to early July 2016, after another 50-plus dates. As you can imagine, the world’s press were waiting on the line to speak to him, so I only had 15 minutes and structure was always going to be key – not so easy with someone known to take conversation off into other realms. We packed a lot in though, and I’m pleased to say his ready wit was to the fore, with this Somerset-born comic never anything less than genial, our conversation punctuated with plenty of laughter at both ends of the line. He may have just been humouring me, of course, but I was impressed all the same. Sometimes you just know you’re talking to a genuine good bloke. 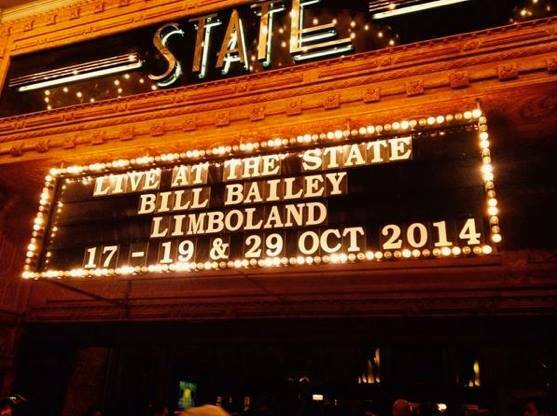 Internationally, Limboland’s already gone down a storm, with plenty of packed houses and critical acclaim. 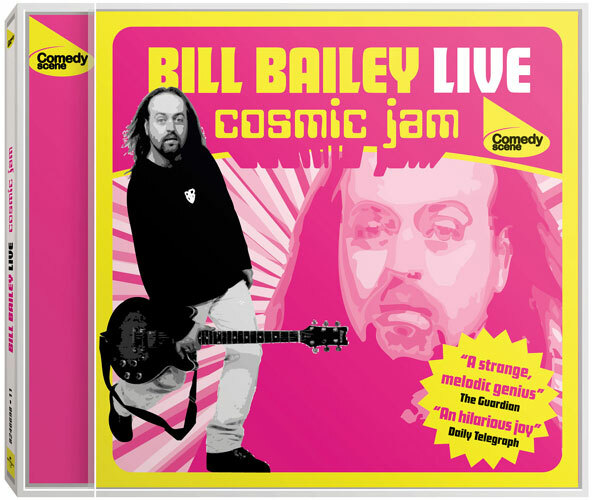 But from his love and appreciation of history and science to a penchant for popular culture and his boundless imagination and creativity for music and comedy, there’s always plenty of substance in a Bill Bailey live performance. So Bill, Limboland is – I understand – about the gap between how we imagine our lives to be and how they really are. Was that the outcome of a comic’s whiteboard session – a bit of blue sky thinking outside the box, as they might say on those awful business seminars – or just a late deadline for the posters? “Comedy stand-up shows, I find, tend to progress in a rather haphazard way, and you get ideas and inspiration from all kinds of random sources – things that happen to you, like family holidays that go wrong or the daily frustrations of just living, moments of reflection, a bit more kind of contemplative wider things that all sort of coalesce into one. “Gradually, that’s what happened with this show. I realised a lot of the stories and routines were sort of veering towards a similar theme that was emerging – that life doesn’t quite match up to how you imagine it’s going to be. 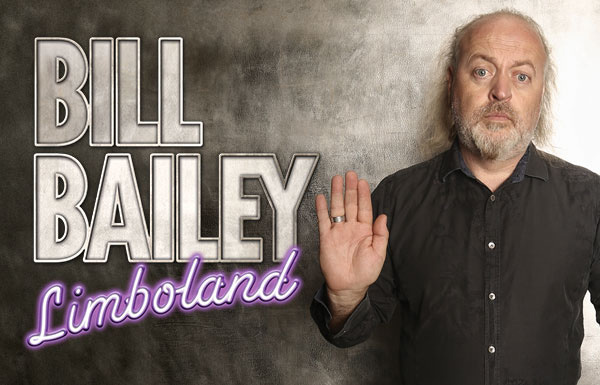 No Bill Bailey show is complete without music, so there may also be his version of the protest song, a heart-rending country’n’western ballad played on a Bible, and a fabulously downbeat Happy Birthday. So will he stick to the plan, or veer off wildly (as we probably expect)? “I do tend to, yes. Sometimes it goes completely off the rails, and I always like the shows to be not too polished and slick – otherwise I’ll lose interest. I need to churn it up a bit. “As a show progresses and as you tour, material changes and things come into the show, while other things are dropped. It sort of rolls forward, in a slightly organic way. The sheer size of this tour is colossal. Do you look at all those dates and wonder what you’re letting yourself in for? “It is a bit daunting, and there are the ups and downs, like being away from home. The novelty of hotels wore off a long time ago. “What I tend to long for are the other experiences – to explore wherever I am, to get out there and get into the outdoors and educate myself a bit about every place I go to. “I recognise I’ve been fortunate, and it’s a fortunate profession to be in, and I don’t want to squander that opportunity. I get the chance to go all around Britain, and see so much of it. Does he have such plans for Blackburn and Preston while he’s here? I won’t go into the details of Bill’s impressive career progression here – it’s all on his website and elsewhere. But it’s been a busy last couple of decades for sure, between live, TV, radio, acting and charity work. And it doesn’t seem to be slowing down. You must miss your wife, Kristin, and 12-year-old son Dax. What does your lad make of it all? “He’s grown up with it over the years, so he knows the score. Years ago I remember him asking, ‘How was the gig?’ when I came in, and he was only around five. “He knows the life we have and fits around it. And occasionally, if there’s time or if it fits with school holidays, he’ll come out on a few dates. Home for Bill between dates is Hammersmith these days. Handy for the Westway and returns to the West Country, I guess? Looking at your parents’ work – his father was a medical practitioner and his mother a hospital ward sister – did a career in the health profession not beckon? “It did at some stage. I did consider following in Dad’s footsteps. But I was so much drawn to the other side – the arts, performance and music – I felt it wasn’t the right fit for me. Going back to your formative days in showbusiness, what were Behind Closed Doors, your first band, like? “Essentially a kind of pop, prog rock band, I suppose, with no shortage of ambition in terms of the epic-ness of what we were aiming at, with sweeping piano riffs and big choruses. So where did the pitch-perfect Bill Bailey’s musical genes come from? “I don’t know. My Dad liked to play the guitar, and Mum loved singing. There was always singing in the house, with the radio on. This British Comedy Award winner has seen success the world, and from sell-out comedy tours and festivals around the world to Bill Bailey’s Remarkable Guide to the Orchestra, it’s been a blast. He’s performed at the Edinburgh Festival almost every year since his 1995 Cosmic Jam debut, while branching out as a dramatic actor, his big screen roles including Saving Grace, Hot Fuzz, Nanny McPhee and the Big Bang, and Chalet Girl. 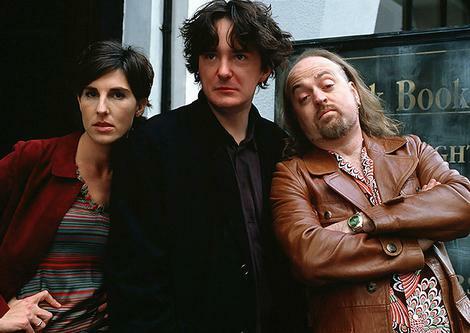 You can also factor in 11 series as a team captain from 2002/08 on Never Mind the Buzzcocks, three series of Channel 4 hit Black Books and a role in Spaced (Channel 4). 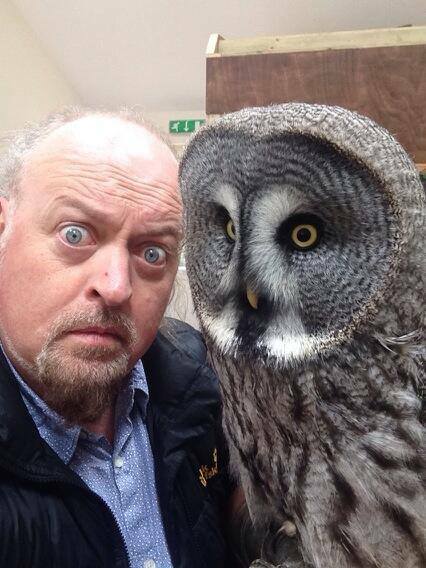 Then there was Is It Bill Bailey? 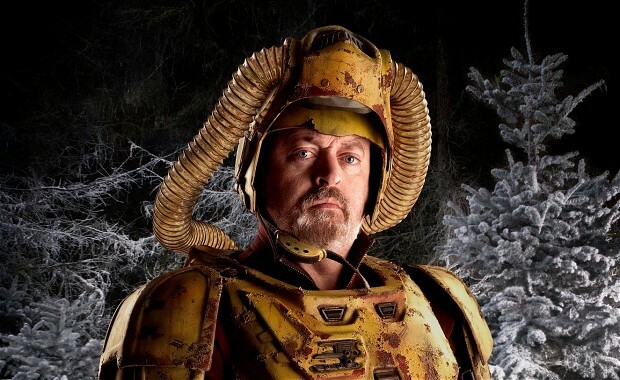 (BBC2), Bill Bailey Live (Channel 4), parts in Jonathan Creek (BBC1) and teen drama Skins (Channel 4), plus panel shows Have I Got News for You (BBC1) and QI (BBC1), and a role in a 2011 Doctor Who Christmas special, playing a Droxil, a Harvest Ranger from the Planet Androzani Major. Any more Dr Who appearances lined up? Bill’s a great one for science fiction of course, which gave me a good excuse to ask him about his Trekkie credentials. I’ll put you on the spot now (one where you get teleported up, prefereably), and ask what your favourite Star Trek moment is. “Ooh! Erm, there’s an episode where Kirk is marooned on a planet with a giant sort of lizard thing. I don’t know the name of the episode but the bit that has always stuck in my mind is where he can’t teleport off and has to try and find all the materials for some kind of explosion. How’s your supposed (half-hearted) retirement from panel shows going? Is it a case of being strong and showing great resolve … until you get a call from Stephen Fry and Alan Davies? I saw a comedy showcase in Shepton Mallet in the early ’90s involving Matt Lucas and Dylan Moran, which attracted around 20 people. I know you’ve had audiences even smaller than that, but it does bring me nicely onto whether there might be another Black Books series and a return for Manny Bianco? Bill loves his wildlife too, hence Wild Thing I Love You (Channel 4), Bill Bailey’s Birdwatching Bonanza (Sky1), Baboons with Bill Bailey (ITV1), and Bill Bailey’s Jungle Hero. He also supports numerous charities, including International Animal Rescue, Good Vibrations and The Music House for Children, as well as his role as an Ambassador for Youth Music. Then there’s the Sumatran Orangutan Society, Bowel Cancer UK, Prostate Cancer UK, The Asthma Society and Reprieve, among others. Wild Thing I Love You (that wasn’t a comment by the way, much as I admire Bill) and your charity work showcase committed conservation credentials – be it caring for baboons, bears, birds or orangutans. Are there any campaigns we should be aware of? “There are ones I support all the time, like International Animal Rescue. We’re involved with various sanctuaries in the Far East, and also here. “Wild Thing I Love You was about practical ways to help animals in strife, and I think actually that’s something everyone can get involved in. “We have such a fantastic range of bird and wildlife here. We’re only a small country, and there’s not an enormous amount of room left. “If we can preserve the wild places, it means they’re going to be around for a while. Because once they’re gone, they’re gone. Have you had much call to take advantage of your honorary membership of the Society of Crematorium Organists of late? I wonder if your six-piece The Famous Five and the mighty Beergut 100 were the finest bands I never heard. Any reunions planned? “The Famous Five are all scattered to the four winds … or largely around the West Country, whichever way you look at it. Was the Bovington Gurney School of Performing Arts and Owl Sanctuary the making of you? From voicing a sperm whale in The Hitchhiker’s Guide to the Galaxy to narrating animated reading books for dyslexic children, and early antics accompanying a mind-reading dog, it’s not the average CV. What can we expect next (in an unexpected way)? “It could be anything really. I’m about to record a very lovely audio book version of the Jungle Book, and I’ve been involved with the Outward Bound Trust, encouraging young people to get out there, out of their comfort zone, so may be involved in some preposterous kind of slightly hair-raising activities to raise money for them. “I’ve just done a long walk across the Ridgeway to raise money for Cancer Research (raising more than £10,000, with a link here to his justgiving page to top that up), and I’m developing all sorts of ideas for TV – comedy ideas and perhaps something about the first man to discover Alaska, and first Englishman to arrive in Australia. 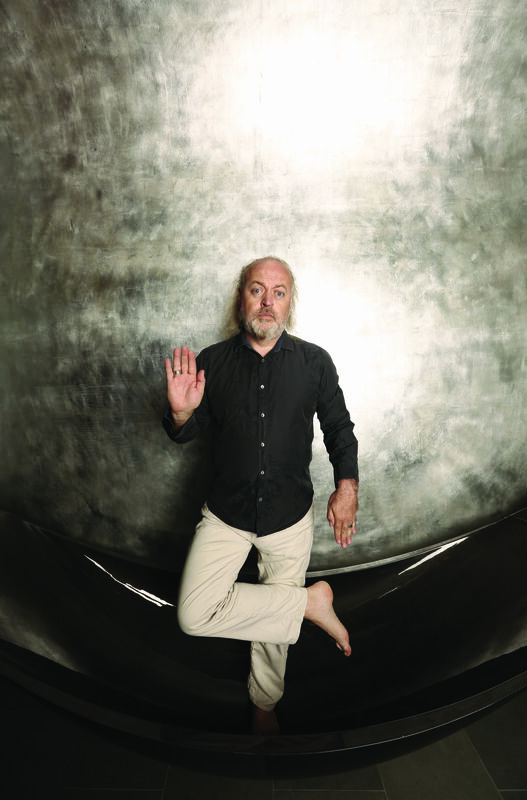 Bill Bailey is at Blackburn King George’s Hall on October 23 and 24, with details on 01254 582579, and at Preston Guild Hall on November 13 and 14, with details on 01772 80 44 44. All shows on the tour start at 8pm, with tickets £25 plus venue administration fees. For more date and ticket information try www.TicketMaster.co.uk or call 0844 844 0444. 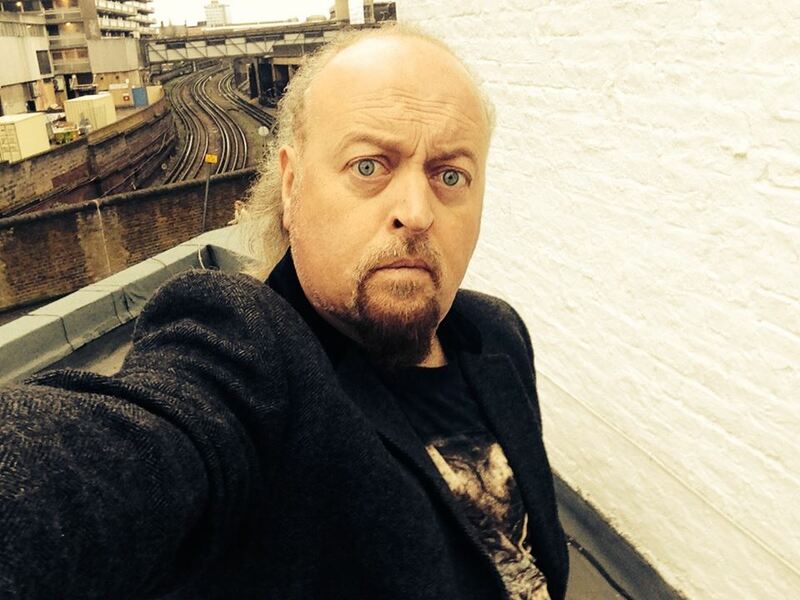 And for all the latest from the man himself, head to www.BillBailey.co.uk. This entry was posted in Books Films, TV & Radio, Comedy & Theatre and tagged Bill Bailey, Black Books, Dr Who, Dylan Moran, International Animal Rescue, Limboland, Never Mind the Buzzcocks, QI, Star Trek, Wild Thing I Love You. Bookmark the permalink.